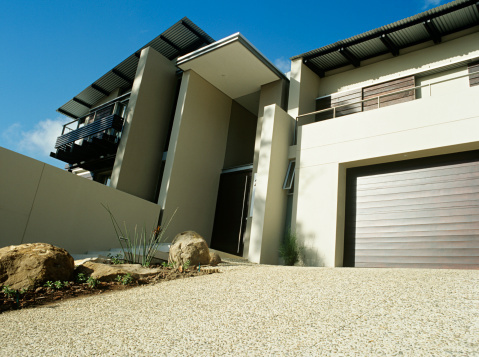 Genie garage door openers are mechanical door openers for residential garages. The door openers can be operated with an electronic control pad attached to a wall or by one or several remote control units. Each remote has a different code, which can be programmed into the power head of the garage door opener. You can also erase all of the codes programmed into the power head and reprogram the device when needed. Place the ladder under the garage door power head and climb so you are within reach of the control buttons. The power head is attached to the ceiling of your garage. Press and hold the "Learn" button on the side of the power head for approximately 10 seconds, or until the indicator light turns off. This will delete all programmed remotes from the memory of the unit. Push and release the "Learn" button. The indicator light will start blinking rapidly. Press the button on the remote control. The indicator will stop blinking but remain lit. Store the remote control in the power head's memory by pressing the same button on the remote control again. Repeat Steps 3 to 5 to program additional remote controls into the garage door power head.